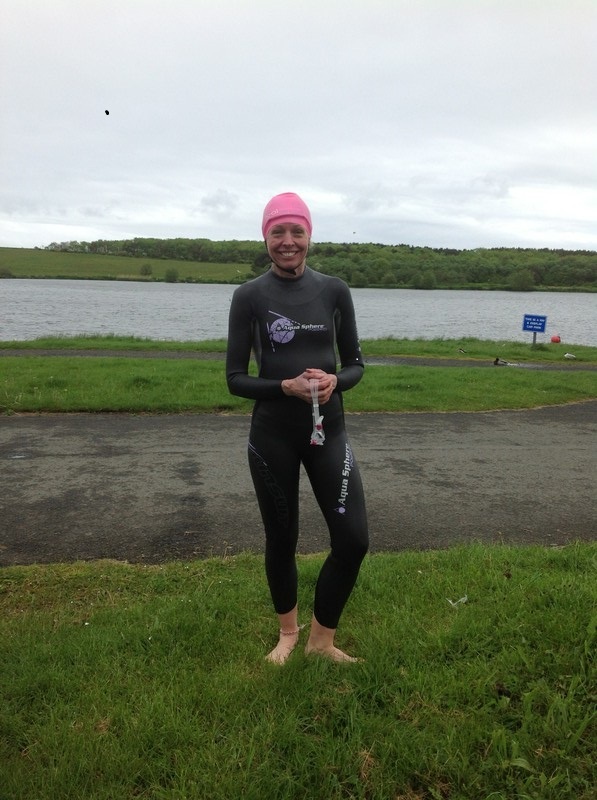 “I met Tracey at the Ashington Sprint tri in May, a pool based swim. I explained that this was only my second tri as I was new to swimming and joked “can you stop people crying at the thought of getting into a lake” as I’d tried to start open water swimming, and in my eyes failed miserably. Basically I was petrified, cold and in a doom loop – too scared to swim much, which made me cold, which stopped me breathing, which made me scared, which stopped me swimming. Happily she said yes she could help! Giddy and slightly high on post-race endorphins and a bacon sarnie I booked to swim with Tracey the following week, and when I said I would “try not to cry” she instantly worked out that the initial problem was I didn’t feel safe. Well I didn’t cry and came out of that session laughing, booking in for another that week, and after only 5 sessions we swam the 750m sprint course at Ladyburnl Lake and stayed in to “play about in the water practicing starts”. Tracey convinced me to enter the Ripon Black Sheep Olympic distance tri a few weeks later and the swim was incredible an absolute highlight of my year, I can honestly say I loved it! Every second! Not only did I know how to swim in the lake I knew what to expect from the other competitors, how to manage a deep water start, how to sight – I felt ready for it. Not only has Tracey worked out what worried me she taught me coping strategies (which I’m not sharing as they are her secrets!) but I now have a little routine I go into before I swim in open water and then I’m away. I’m not fast (yet), but I’m very happy!! The week after Ripon I did the Newcastle Triathlon and really felt like I deserved to be there. Then I decided to try sea swims and after a pool tri. Tracey met me at Newbiggin to get me ready for the sprint tri and I was back to scared and hating it again – I was amazed how much the sea fought back and that really threw me initially. 3 sessions later and I finished the race and Tracey was even there to see me cross the line. I’m not suggesting that any triathlete should go down the same road as Lance, but much of the illicit doping was to recover as fast as possible from training and racing. Do the same, by following the simple principles in the recovery pyramid (http://nickgrantham.com/precovery). Prioritise the basics (sleep, nutrition and rest) and get these principles nailed before worrying about anything else. I keep hearing the refrain “it was a level playing-field”, but it wasn’t. Armstrong had the best of the ‘sports scientists’ contracted, making sure that he was getting top-notch advice and properly looked after – no 2am wake up calls for a quick turbo session for Lance! Invest in the best you can for yourself. Take the time and effort to source high quality foods from local shops, rather than McBurgers or dodgy supermarket own-brand sausages. Same for your kit – take your time to research what will give you the biggest bang for your buck over the long-term, rather than buying kit that’s the latest fashion. Before the Armstrong years, popular cycling wisdom had the pro’s riding a big gear at a relatively low cadence. Lance popularised a riding style with a much higher cadence, helped by a higher red blood cell count that allows a more oxygen to be carried. Similarly, race to your strengths, by selecting courses that suit you, whether its hilly or flat, with a relatively longer run or bike. In conclusion – do the right things, but don’t go quite as far as Lance did! April is generally where things starting getting a little more serious. With a training camp in Mallorca planned for the end of the month and nights getting lighter, I had a bit of a bike focus. Got a couple of long rides in, but most rides were relatively short and hard – typically 90-120 minutes of fairly structured riding. This included numerous climbs of a longish local hill (~10 mins), aiming to hold threshold pace or just above, plus some short hard efforts. Swimming was consistent (3 x per week, knocking out sessions of 3.5 – 4k), and lead to some improvements. My gym programme stayed fairly consistent as well, getting in twice a week and lifting heavy (deadlifts & squats, dips and pull-ups). Typically, this would be in the evening having swum in the morning – it was noticeable how much stronger I felt on the odd occasion that the gym was my only session of the day. This doesn’t worry me, as the focus is on the three triathlon disciplines and the gym is there to support those. Running continues to be the weak spot – its starting to come back, but there’s no ‘easy’ runs at the moment. The Mallorca trip was a very solid week – lots of (hard) bike miles with some consistent running in the mix – so I ended the month feeling fatigued. A couple of sessions were dropped to allow recovery, but the fitness benefits in the long term far out-weigh the heavy legged feeling in the sort term. Just back from Pollenca in Mallorca, and thought I’d write up a few notes on what I did well / badly for getting the most out of the camp. I went to the camp to get miles in the legs and improve my fitness – pre-camp was focused on strength work (hill repeats, etc.) not long distance. I avoided the camp becoming a week-long race! I was pretty good at building through the camp. We had the toughest day planned for Tuesday of a Saturday-Saturday trip. Until that day was done, I made sure not to go too deep into the red. I set myself a personal target of running every day, despite the others on the trip being roadies – difficult to head out when everyone else is done for the day and relaxing with a beer! Do your homework – I turned up with no clue about Mallorca, so struggled with navigation for a couple of days. This forced me to stick with the group when I was struggling (a good thing), but should have been better organised. In the States, Jeremy Lin has been front page news. A Hollywood sports story, he’s become a superstar after being the last option for an injury-loaded team. The New York Times has a different view. In this article, its apparent that Lin’s success is down to deliberate, focussed practice and immense self-belief. The important question is – how can YOU apply that same discipline to your triathlon skills? This morning’s swim session brought home a useful lesson. Normally, I’m pretty good at pacing myself but today’s effort caused me to blow up on the last set. It was a relatively short set, but quite a lot of hard 100’s. Finishing the swim, all I’ve wanted to do is eat! My body’s been pushed a little further than usual and its not quite sure how to cope. As an occasional thing, pushing the boundaries is a good thing – the worry is how well I’ll recover for my next sessions. The danger is that this will impact future sessions and kill off some of the consistency I’ve built over recent weeks. I’m hoping that the food will have sorted me out – over-cooking a swim set is easier to recover from. Getting bike pacing wrong is generally more serious, as you tend to realise you’ve dug yourself a hole when you’re 30 miles from home. At least in the pool, you can get out and the walk to the showers won’t be too far. Lesson to remember – always leave a rep in the tank! I had one of those annoying sessions on Sunday. Didn’t get my kit ready the night before, then couldn’t find my leg warmers. That meant I had to put the hammer down on the 9-mile ride to meet the Sunday group on time. In turn, that led to a struggle up the first climb. A puncture ended my group ride and I headed home, a couple of hours done but a generally frustrating experience. So what can be learnt? First up (and I don’t know how many times I need to learn this one) is to be organised. I’m great at getting my kit ready in advance through the week – if I didn’t, I’d miss most of my sessions! At the weekend (when I’ve got far more time), I’m not so good. Secondly (an d most important) – its just not that big a deal. A typical training week will be 10 or 12 sessions. Some of those aren’t going to be perfect. Weather, mechanical issues, the real world – all these things can get in the way of training the way you want to. I still got most of what I wanted out of the session – probably a bit more intensity / less volume than I would have liked, but close. Don’t let perfect be the enemy of good enough – consistently getting in sessions that are ‘good enough’ will lead to big performance improvements over time. There’s been an interesting debate on slowtwitch recently, triggered by a tweet from Paulo Sousa and a blog entry by Joel Filliol. I can see some logic to the argument – if you can swim 200m at a pace you’d be happy with for a 1500m, the problem isn’t your technique, but having the fitness to maintain that technique over a longer time. What doesn’t come across in the discussions is the importance of ‘deliberate practice’ when completing your drills. I (and I guess most people) have been guilty of rolling through sets of drills, just waiting to get to the main set. I’ve also been guilty of racing drills, or abandoning some of the technical emphasis in order to hold my position in the lane. In these cases, I’m sure the ‘no drill’ brigade are absolutely correct – I was wasting my time. How do you master Deliberate Practice? “Deliberate practice” is a phrase that’s been bandied about a lot recently. The concept that its not about talent but the work you do is a very appealing one, especially if you think you lack natural talent! Whether you believe in the concepts of the 10,000 hour rule, etc., its easy to fall into the trap of assuming that deliberate practice is the same as listening to your coach and trying hard. The Talent Code: Greatness isn’t born. It’s grown has an excellent description of the process, and its actually in the Amazon preview so you don’t need to buy it. Clarissa the clarinet player breaks down her work into chunks and is able to analyse each note – striving for perfection and repeating it until she gets there. This effort comes at a cost – the practice is tiring, both mentally and physically. Holding that effort is hard, so most people don’t do it. I’m hoping that by striving for perfection in practice and being prepared to work incredibly hard on the process not the outcome, it’ll pay off with PBs in the summer, when it counts.